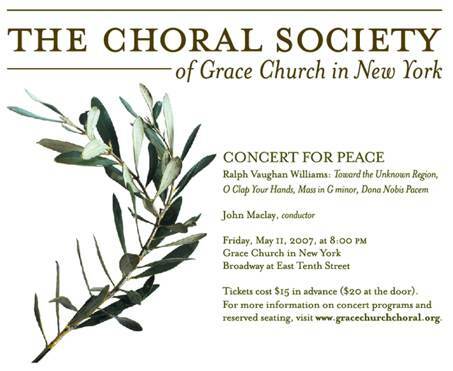 I had to shrink this down to fit so for those who can’t read the tiny type, we’re doing a selection of the music of Ralph Vaughan Williams, and the concert has a theme: Concert for Peace. Tickets: $20 at the door, $15 in advance (from me). I had a total mini-meltdown in the shower yesterday. I was feeling so good and then freaked out in the shower. It was kinda like a panic attack. I guess I’m feeling more stressed out than I thought. It made no sense, I’m ahead of schedule, everything is going well. As soon as I got out of the shower I signed up to learn something that was developed at UMass Medical School called MSBR (Mindful Based Stress Reduction). Sounds new-agey, I know, but I read the results of one study and I was planning to do this later in the year. So, instead I’ll do it NOW. Then I had lunch with a friend who, coincidentally, specializes in addressing stress, and she told me that even if it didn’t make sense, and I’m on top of my to-do list and all, I could still be feeling overwhelmed. That made me feel better almost immediately. Thank you, Cori! I took the rest of the day off. I might take today off, too. I’ve been wanting to see the movie The Lives of Others. PS: This flyer was designed by Mary Horenkamp, the owner of the fabulous Darcy, whose picture you saw last weekend. Stress reduction in the 17-1800’s involved either religion or whiskey. Stacy, does Grace Church make CD recordings of the concerts? And if so, are they available for sale? It would be a way to swell the funds. Good luck with the concert! We do, Carol! For some of them anyway. I wish we had one of our Elijah. But yeah, we’ve done that.